It would seem that growing up seeing pictures of the Kaabah all around, hanging somewhere in the home of seemingly every person you know, on book covers and Eid cards, computer screensavers and even jewelry, and watching the images of millions of pilgrims year after year circling the Kaabah on a small television screen would somehow lessen the effect or the shock of stepping into the Masjid al Haram for the first time and seeing the Kaabah with your own eyes – but it doesn’t. Those images are so ingrained into our minds that we almost take it for granted. It’s engraved in our memories long before we ever step off the plane in Jeddah. Any five year old Muslim child can draw a picture of the Kaabah if he or she is asked and it is likely to be quite accurate. But a lifetime of seeing all those still photos or even moving pictures on a giant screen TV cannot prepare you for the feelings you will encounter seeing the Kaabah, live, up-close and in 3D! It’s like stepping into a fairy tale or living inside a beautiful dream where all the emotions peak and all the senses are delighted. You’re not just looking at a photo any longer, you have actually stepped into it. You have opened the pages of history and inserted yourself into it. The initial shock is overwhelming. Some will cry and some will laugh. Some will stand in awe unable to speak. The mind instantly empties all thoughts of this life like a swollen river flowing over a cliff, and is instantly flooded with the sweetest names of Allah. 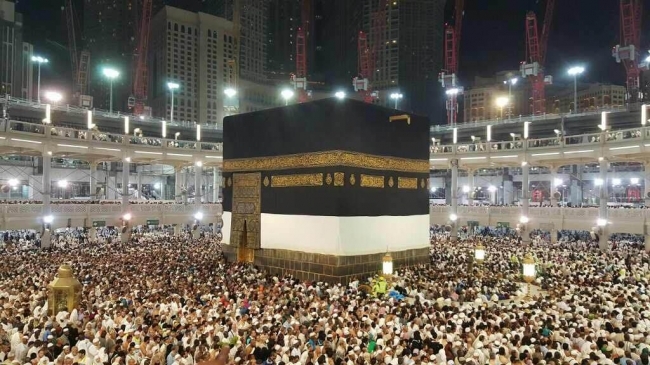 There is an overwhelming sense of humbleness and humility, and an instant bond of unity with every pilgrim who has traveled from near and from far, the young and the old, the rich and the poor, all gathered in this one holy place to worship Allah and fulfill their obligation to Him, just as you are. The heart aches from the love of Allah’s messenger (PBUH) who was born in this holy city and who cried when he left it because he loved it so much. And you will love it too. Once your feet have walked in the footsteps of our prophet (PBUH), no other place in the world will ever be able to hold the same esteem in your heart or provoke the same longing in your soul as Makkah. The taste of the Zamzam water, the smell of bakhoor in the air, the voices of millions of pilgrims calling out to their Lord as they circle the Kaabah, and even the smooth, coolness of the tile touching your forehead in sujood, all provoke memories within the senses that will keep calling out to you for the rest of your life. There is really nothing anyone can tell you that can completely prepare you for the experience of Hajj. It is, as it should be, a life changing experience. It is so amazing, but not surprising that Allah in His infinite wisdom set this obligation on us, which has such a profound impact on so many aspects of our life. The fact that pilgrims from all over the world must gather in the same place at the same time to perform this duty has so much wisdom in it. Not only is the pilgrim following Allah’s order to perform the rituals of Hajj commemorating the test our Prophet Ibrahim (PBUH) went through, but it is also one of the only opportunities most Muslims will ever have to connect with the roots of Islam. The pilgrim has this golden opportunity to visit the birthplace of our Prophet Muhammed (PBUH), to feel the emotion of walking where he once walked, and to see the history of Islam face to face, while becoming part of that history. This is a blessing which can never be attained by merely reading books or seeing photographs. Another overwhelming aspect is the state of Ihram itself, that every man is wearing the same two piece unstitched garment making it virtually impossible to distinguish the king from the pauper. A person’s status has been left behind, and everyone is brought to the same level of humility in front of our Creator. Just as in shaving the head, vanity is cast aside, and again, everyone is brought to the same level of humility and humbleness. It’s so hard to imagine if Allah had not made Hajj an obligation on us, most of the Muslims in the world would never have an opportunity or a reason to ever visit this holy place, or be able to experience this personal connection with our history. Rows and rows of big white tents in every direction, this is the scene greeting the pilgrim arriving to Mina. Busy and thriving, every section like a miniature little country, where every language is heard, but at prayer time all are united in worship, standing in straight lines, facing one direction, making the same movements, praying to Allah in one language. Again, we are overwhelmed by the humility, doctors and dishwashers sleeping side by side on simple mats on the floor. Some say it’s the most productive sleep anyone will ever feel, when the body is fatigued, but the spirit is renewed and awakened. There is a new meaning to the concept of brotherhood. Friendships are forged with people we might never see again, but the experience of Hajj engraves them in our hearts and memories, guaranteeing they will never be forgotten in our du’a. The prophet (PBUH) said that Hajj is Arafah, and keeping that in mind, the anticipation runs high on the way to this place of mercy, but nothing can prepare the pilgrim for the actual sight that greets him upon his arrival. The Jabal an-Noor appears as a tidal wave of white frothy foam coming out of the desert, every space covered by pilgrims all dressed in white, with their hands extended in the air, praying for forgiveness and mercy, some crying, some smiling, swimming in the bliss of khoshua’ with their Almighty Creator. And while there are tents for the groups to rest in and escape the heat of the sun, most pilgrims remain standing, steadfast in their prayers, preferring the heat of the midday sun to free them from the heat of the hellfire. The time seems to pass so quickly, trying to squeeze in a lifetime of prayers before the sun sets. And how beautiful is the sunset in this blessed place, preparing to leave for Muzdalifah, spiritually renewed and saturated in Allah’s mercy. I doubt any pilgrim would ever leave Arafah without begging Allah to allow him to return again someday. For those of you blessed to embark upon this journey of a lifetime this year, you will carry with you a piece of the hearts of all of us who have been blessed to experience the sacred pilgrimage before you. We all long to return someday, just as the soul longs to return to its Creator. Remember to savor each moment of worship in its highest and purest form, remember us in your du’a, and may Allah make your Hajj mabrour.